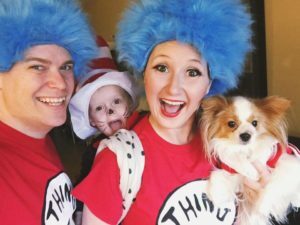 With Halloween quickly approaching, families often try to think of ways to incorporate their little ones into their costumes. Babywearing is a great way to accomplish this! It can be fun, creative or simply functional. 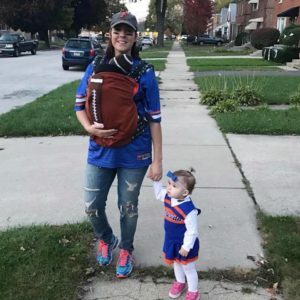 Whether you are pulling together a themed family costume or just want your little one to be dressed up as they are along for the ride, there are a variety of ways to create a babywearing Halloween costume. Dog costumes fit great on carriers! Typically you want a size large (though XL is sometimes necessary depending on the costume fit and your carrier). Most dog costumes have velcro to go around the dog’s belly. Use this velcro to go around your carrier and stick on the inside. If it is the type that requires using arm/leg holes and your carrier shoulder straps unclip, you can feed the carrier straps through the arm holes of the costume. Some costumes meant for babies can be worn on your carrier as well. If your carrier shoulder straps unclip, you can feed them through the armholes and the carrier will wear the costume instead of the baby. 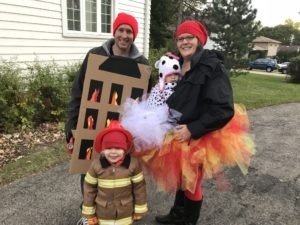 There are a variety of ways to easily make your own costume with the help of everyday items. You can use velcro, tuck a piece of fabric around the carrier, or use a child size t-shirt (around size 5T). 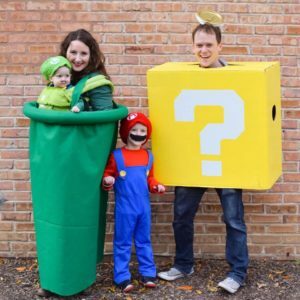 And for those of you with multiple kids (one of which is in a carrier), you can coordinate your kids’ costumes or choose a theme the whole family can get on board with! When creating a babywearing costume, ensure that you are not changing the structure or function of the carrier. Your baby should be placed in the carrier following manufacturer guidelines and safe practices. The costume should not involve anything that could change the structure such as sewing or ironing on pieces.